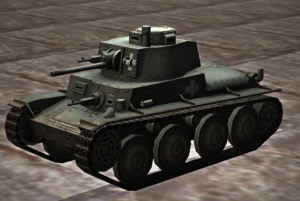 The Panzerkampfwagen 38(t) was originally a Czechoslovak tank of pre-World War II design. After Czechoslovakia was taken over by Germany, it was adopted by the German Army, seeing service in the invasions of Poland, France and the USSR. Production ended in 1942, when its main armament was deemed inadequate. In all, over 1,400 Pz. 38(t)s were manufactured. The chassis of the Pz. 38(t) continued to be produced for the Marder III (1942–1944) with some of its components used in the later Jagdpanzer 38 (1944–1945) tank destroyers and its derivative vehicles.